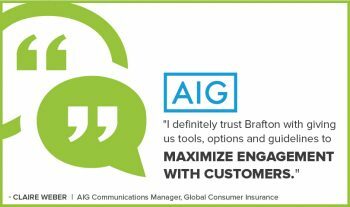 AIG Travel has relied on Brafton for content marketing strategy and content creation for over five years. In this video, AIG Travel Communications Manager Claire Weber discusses her experience working with Brafton and the Video Marketing team. AIG came to Brafton looking for a content marketing partner to help produce video assets for their business. The goal was to find new ways to maximize engagement with customers. In the end, Brafton’s expertise in video services and adherence to brand guidelines has resulted in high-quality videos that have helped to drive results.